Michael Joseph Alstott (born December 21, 1973), nicknamed "A-Train", is a former American football fullback in the National Football League (NFL). He spent his entire 12-year career with the Tampa Bay Buccaneers. He played college football at Purdue. 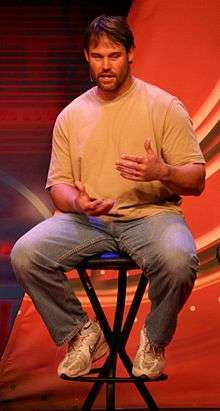 During his career, Alstott was selected to six Pro Bowls and won Super Bowl XXXVII with the Buccaneers. Alstott attended Purdue University for four years, where he became the first player in school history named MVP in three consecutive seasons. Alstott scored 12 touchdowns as a sophomore, 14 as a junior and 11 as a senior, and held the Purdue rushing touchdown record with 39 until Kory Sheets broke it in 2008. He averaged 5.6 yards per attempt during his Purdue career before graduating in 1995 with a bachelor's degree in business. He finished as Purdue's all-time leading rusher with 3,635 yards, including a school-best 1,436 yards in 1995. Alstott signing autographs in 2006. Alstott was selected in the second round (35th overall) by the Tampa Bay Buccaneers. The Buccaneers utilized Alstott primarily as a running fullback as opposed to a blocking fullback that teams were starting to switch to at the time. He was a member of the Tampa Bay Buccaneers team that won Super Bowl XXXVII (2002), played at Qualcomm Stadium in San Diego, California. Alstott rushed for 15 yards and the first Super Bowl touchdown in Tampa Bay Buccaneers history. He also caught five passes for 43 yards. In the summer of 2007, shortly before he suffered his season-ending and ultimately career-ending neck injury, Alstott appeared in a television commercial for ESPN Fantasy Football along with former teammate Warrick Dunn, who was later signed by the Falcons. Alstott is married to Nicole Alstott. They have three children; daughters Hannah and Lexie and son Griffin. Their family currently resides in St. Petersburg, Florida. Along with his wife Nicole they formed the Mike Alstott Family Foundation. Alstott also owns Island Way Grill, a restaurant in Clearwater, Florida along with former teammate tight end Dave Moore. 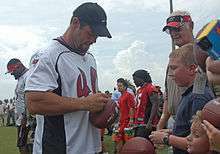 Alstott also hosts an annual football camp. He was given the key to St. Petersburg on February 13, 2003. He makes an annual visit to St. Petersburg All Children's Hospital. Alstott also coaches youth football for the Seminole Chiefs and is head coach for the Northside Christian Mustangs in St. Petersburg, Florida. ↑ "2011 Purdue Football Information Guide" (PDF). cstv.com. Retrieved 2011-11-07. ↑ "Buccaneers101.com's Top 25 Buccaneers of All-Time: Number 5 – Mike Alstott". 1 2 "Mike Alstott". ESPN Internet Ventures. Retrieved 23 January 2014. ↑ "Alstott & Family". Retrieved 2008-12-31.